If you’re thinking about replacing missing teeth, your dentist in Virginia may recommend dental implants. In certain cases, these small dental appliances inserted into the upper or lower jaw may be a more appropriate solution than dentures. It really depends on your health, your lifestyle, and the problem that needs to be fixed. People with loose or poor-fitting dentures because of flat ridges, or those missing multiple teeth who need support for crowns and bridges, are the most likely candidates for implants. For patients who meet the criteria, dental implants offer a number of advantages over dentures. Aside from feeling more natural than dentures, implants offer an alternative for those whose dentures are loose or poorly fitting. Dental implants can reduce the movement of bridges, crowns, and dentures, as well as provide support for removable dentures and bridgework. And, like dentures, dental implants improve your speech and appearance, promoting greater self-confidence. To receive dental implants, the ideal candidate must be in good overall health and have healthy gums and adequate bone structure to support the implant. If a patient has health conditions that would impact healing, an implant may not be the best choice. Heavy smoking or drinking may also preclude implants. The patient must be committed to meticulous oral hygiene and willing to make repeat visits to the dentist. In general, dental implants are safe for those who pass the initial screening. 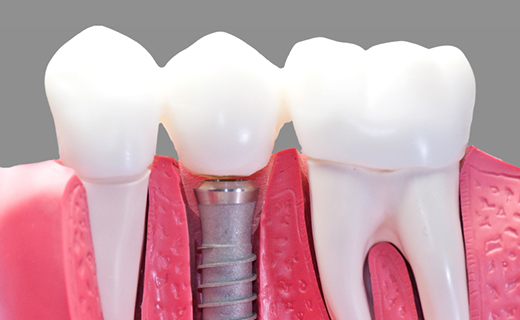 There are two types of dental implants: endosteal and subperiosteal. The endosteal implant, the most common type, is inserted into the jawbone to serve as the tooth’s root. For those who can no longer wear conventional dentures, the second type, subperiosteal dental implants, are a lightweight option designed to fit directly on the existing bone. Both options are typically made of metals like titanium, which are biologically compatible materials, to avoid the antigen-antibody response that sometimes leads to rejection in heart and kidney transplants. Your dentist in Virginia will provide the dental implants cost and other information to help you make the right decision based on your circumstances. Dental One Associates offers affordable family dentistry and gentle, compassionate dental care in Virginia. With 4 affiliated practices throughout Virginia, our offices are conveniently located with extended hours to meet your needs. At Dental One Associates of Virginia, we provide most dental services, from basic preventative care and general dentistry to specialized procedures and complete dental reconstruction. We accept most dental insurance plans and offer affordable financial solutions for any budget. Patient satisfaction is our top priority and we strive to provide the exceptional, affordable dental care and personal touch that lead to lasting relationships. A smiling patient is our greatest reward and we look forward to keeping those smiles healthy, beautiful, and bright. Discover an affordable dentist who truly cares at Dental One Associates of Virginia. Dr. Mittal was amazing! The receptionist was very helpful and so was the insurance manager. Excellent customer service the entire time! I had a great experience yesterday at the Dental One Associate. Team was very friendly ,professional and knowledgeable .Thank you for your great service. Entire staff is warm and welcoming professional, and highly competent.